What Does a Medical Laboratory Specialist (68K) Do? In the U.S. Army, medical laboratory technicians, also known as medical laboratory specialists, are integral members of the medical laboratory technician team, who conduct tests on the tissue, blood, and bodily fluids of patients. Their work is crucial to the medical staff, as it aids doctors and nurses in the diagnosis, prevention, and treatment of disease and other medical disorders, as well as war wounds and injuries of Army personnel. This key Army job is categorized as a military occupational specialty (MOS) 68K. You'll work alongside other medical professionals, and although you're not a doctor or nurse, your work is a key part of keeping the Army and its troops healthy. These duties are important for keeping Army personnel healthy through proper testing, diagnosis, and treatment. This job is suitable for someone interested in medical procedures who enjoys examining bacteria and parasites under a microscope. Department of Defense security clearance is not required for this position, but you'll need to demonstrate completion of high school-level chemistry and algebra, or equivalent exams, to be recognized by an Army Education Center. In addition, you'll likely need to produce official high school and college transcripts. Applicants must meet additional education requirements such as an associate or bachelor's degree in medical technology or a related degree from an accredited college or university and additional experience, training, or certification. Job training requires 10 weeks of basic combat training and 52 weeks of advanced individual training (AIT) at a major military hospital for residency training including practice-testing specimens. Once you have your AIT, you'll learn medical lab procedures, including administration and record keeping, and you'll study human parasites and diseases. To qualify for the MOS 68K, you'll need a score of at least 106 in the skilled technical (ST) section of the Armed Services Vocational Aptitude Battery (ASVAB) test. According to the Bureau of Labor Statistics, employment of medical laboratory specialists is projected to grow 13 percent from 2016 to 2026. While not necessarily applicable to this military position, as people live longer, there will be a greater need to diagnose medical conditions, such as cancer or type 2 diabetes, through laboratory procedures. Once medical laboratory specialists leave the service, the chances of finding work in the field are positive. 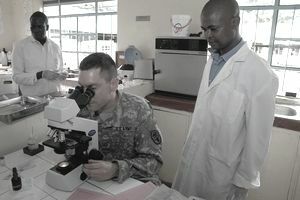 Medical laboratory specialists work in medical facilities, such as Army clinic or hospital laboratories. They are trained to work with infectious specimens as well as materials that are caustic or produce fumes. They must, therefore, follow proper procedures to control infection and sterilize equipment to decrease the risk of contamination. Medical laboratory specialists wear masks, gloves, and goggles for protection. In addition, medical personnel may need to stand for long time periods as well as lift or move patients to collect samples for testing. Most medical laboratory specialists work full-time in facilities that operate day and night, such as hospitals and some independent laboratories. Personnel may work evening, weekend, or overnight hours.